Ben Case will fly the flag for the local training corps at Towcester on Thursday, on the back of an exciting winner at Doncaster at the weekend. Case has made three entries for the fixture at the county track where the action is due to get underway at 1.40pm. Princess Roxy delivered a welcome success at odds of 14/1 for the Edgcote handler at Town Moor, where the benefit of racecourse experience (a point to point victory in Ireland in April) stood the daughter of Midnight Legend in good stead as she came home a length and a quarter in front of Darling Du Large from the Tom George stable. Perhaps the best of Case’s intended Towcester runners this week will be the six year-old Shanroe Saint which is poised to take his chance in the 1m 7 1/2f handicap hurdle at 2.15. This French bred gelding has been knocking on the door in his six runs so far this season. Although he has yet to register a win, Shanroe Saint was a runner-up at Warwick in November and has also been placed third on a couple of occasions in respectable fields. His owners, the Polk Partnership, are based at Fenny Compton, north of Banbury. Any success for Shanroe Saint will augur well for the chances of Dr Des which should run for Moreton Pinkney based owner Richard Whitehead in the 2m 3f Star Sports Daily Specials Novices’ Hurdle at 3.25pm. The Henry Oliver-trained seven year-old has only had three outings in this country but has shaped as an exciting prospect on each occasion and looks to be heading to the Cheltenham Festival in March. Dr Des was a winner at Stratford in October when Shanroe Saint was third, and his subsequent efforts have been even better, as he ran a runner-up in a higher grade behind both Mr One More and Claimantakinforgan, trained by Harry Fry and Nicky Henderson respectively. Both of those outings were at Ascot. Whitehead has enjoyed a far better season than 12 months ago, with five winners to his name and can look forward to a sprinkling of runners next week. 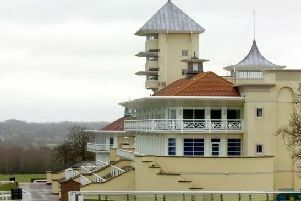 He said: “We are running Dr Des at Towcester to discover whether he will stay the 2m 5f trip at Cheltenham. The Robin Dickin-trained Some Finish could be worth another chance in the 3m 1/2f Star Sports Daily Specials Handicap Chase at 2.50pm. The Dickin team continues in great heart after the success of Dontminddboys at Leicester last week and All Is Good at Hereford on Monday. Some Finish has won two and finished second from three visits to the Northamptonshire track although he finished down the field here before Christmas behind Bob Buckler’s Ballyegan which could be a live contender later on the card, in the 2m conditional jockeys’ handicap chase.